FREE TO JOIN! We just need your email. REDEEM Points at the Snack Bar for eligible items. CHOOSE from all sizes of Popcorn, Fountain Drinks, or the Snack Pack when you have the right number of points. Sign up now and pick up your card next time you come to the movies at any of our theaters. Besides Snack Bar Rewards, Movie Club Members enjoy surprise ticket giveaways, Members Only Deals like 2-for-1 tickets on select movies, and more. Stay tuned and check your email for more perks! Points are earned only at time of purchase with valid Member ID. Member must present Movie Club Card or sign-in with name, email, or phone number at time of transaction. Online, member must log in before purchasing advance tickets. Points cannot be added after transaction is complete. Points are non-transferrable and can only be redeemed for eligible items. Membership sign ups are available at these Sierra Theaters locations: Sierra Cinemas, Sutton Cinemas, and the Del Oro Theater or online at www.sierratheaters.com. Members will be automatically signed up for the Sierra Theaters Weekly Showtimes Email and Special Movie Club promotions. Sierra Theaters reserves the right to change, alter or discontinue the program at any time without any liability to members. Membership information collected by Sierra Theaters will not be sold or shared with any other company. 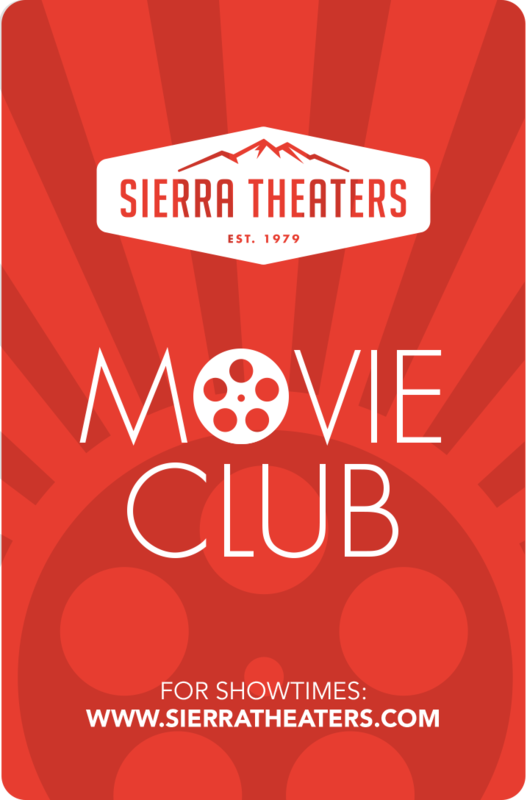 For questions regarding the Sierra Theaters Movie Club, please call (530) 477-1100 or email mainoffice@sierratheaters.com.